Start a chimney of coals. Mix the flour salt and pepper. Coat the sirloin pieces of beef, with the flour mixture. When the charcoal has white tips they are ready to use. Place 12 briquettes under the dutch oven. Add the oil and heat until hot. Place the beef into the dutch oven to brown. Turn frequently. Add the beef stock, Worcestershire sauce, bouillon cubes and the Mrs. Dash beef stew seasoning mix. Stir until combined. Add the vegetables and bay leaves. 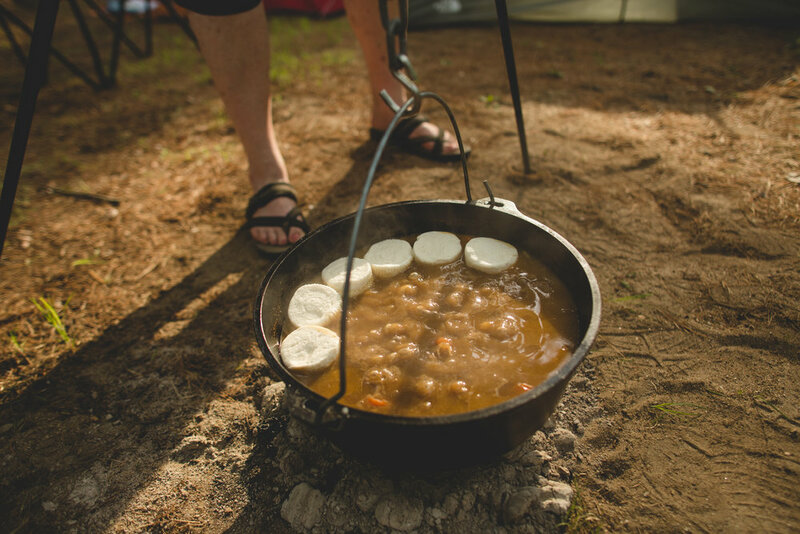 Cover the dutch oven and cook for about an hour. Stir after a half hour. Check vegetables for doneness. Continue to cook until all the vegetables are fork tender. At about 45 minutes into the cooking time, start another chimney of briquettes. When you feel that the vegetables are fork tender place the biscuits on top of the stew. Cover the dutch oven and place 10 briquettes on the top. Cook until biscuits are lightly brown. About 10 to 13 minutes. Serve and enjoy!